Laura is still a hostage of the Jennifers. The young girls chose which of Laura and Autumn was the more valuable. Autumn didn't like the answer. Welcome back to the commentary. Please read the chapter first before continuing. I've moved some long stuff off screen. Caitlin threatening the juniors, I felt, is best left implied instead of shown. No one really needs a chapter with Caitlin just ripping into younger girls like a drill sergeant. The Jennifers returning Autumn was also left off-screen. Having Autumn appear tied to a bed lets the audience have their imaginations run away with themselves. The opening scene shows that Caitlin will focus on her needs, including putting herself ahead of her roommates. Sure, she didn't know Autumn had been returned for a refund, but stopping to do her English homework while two of her roommates are the prisoners of the Jennifers is Caitlin taking full advantage of the situation for her benefit. Down in the Lair of the Jennifers, Laura's still investigating. Being new herself, Laura doesn't get that the Jennifers are the school's version of a Star Trek redshirt. Thus, the nameless, faceless horde who would've had a different look each time one of them appeared if this was a webcomic starts to get names and individualized. Not the intention when I started, but that's how the story evolved. So far, it's just Jenn and Kristie, but now that I've started, Laura will meet others as needed. Jenn is serious about keeping Laura until her missing classmates are back. Laura has reasons for not wanting to disappear, specifically, the trial against her father. Jenn also has noticed that Laura doesn't treat the Jennifers like everyone else her age does. Laura makes a point of learning people's names. Her little bit on politeness is based on events that have happened in Ontario; it is not unknown for gangs to murder rivals and leave them in fields. Juliana's footlocker wasn't planned, but came from needing to keep the story moving. I had an idea of what happened, now was the time to start revealing. Juliana's belongings became key. As Laura explains, there's a difference between leaving willingly and being forced. If a girl was allowed to get some of her things before being taken away, she might leave a clue behind, either something of hers that she's never seen without or making a point to be messier or neater than normal. A girl who leaves of her own free will is just grabbing her good stuff. Laura's reasoning is filtered through her background. She may have thought about the situation a little much. The last sentence of the chapter is Laura starting to get into how life at the Academy works. There's something she wants, there's something Jenn wants, there's room for negotiations. Poor, Jenn. Laura is scaring her, more than Caitlin ever could. TomorrowLater today, Chapter 5, "Early Morning Shenanigans". Also tomorrowtoday, over at Psycho Drive-In, continuing the history of adaptations with the early years of film. Saturday, over at MuseHack, The Equalizer. "Caitlin, I don't like this." "We're looking for an Unruly?" "What's stopping them from stealing a uniform from the Academy, then?" "Then let one of us go back." Caitlin and Skye returned to their dorm room. Inside, the red-haired girl flicked on the lights. The scene in front of her halted her. Autumn was tied down In Caitlin's bed, spread eagle, each wrist and ankle bound to a different corner. The Asian girl raised her head. "About time you got back." "This is different." Caitlin removed her blazer and hung it up in the closet. Skye continued in to the kitchenette to retrieve a bottle from the fridge. "The Jennifers didn't even do this to Cassandra," the red-haired girl continued. "What did you say to them?" Autumn pulled at her bonds. "Can I get untied first?" Or do I mean Hack? 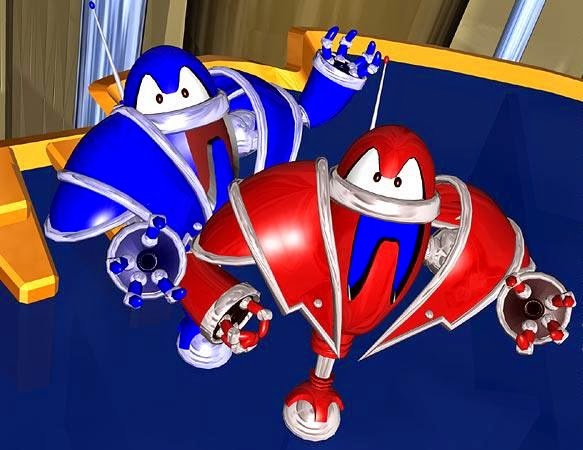 Slash is the blue one on the left, Hack is the red one on the right. Or, Hack is on the right and Slash is on the left. "This Jennifer might know something." "Someone could be getting them ready for transport to where they'd sell well." "But that means we all go to the Jennifers' lair." Caitlin led her troops down the hall towards the first-year student dorm. While the red-haired girl marched with purpose, the rest of her roommates weren't as sure of themselves. Autumn kept close behind Caitlin, never focusing on anything any longer for several seconds. Laura followed the Asian girl by several paces, eyes wide, jumping at any creak. Skye brought up the rear, keeping watch for the group and ready to leap to the front if trouble arose. The group's footsteps echoed in the hallway. Lights flickered overhead, adding to the unease the group felt. Laughter and scurrying bounced off the walls. Caitlin held up a hand, bringing the troop to a stop. She waited, trying to hear if the noises continued. "Hello?" A beat started, a soft tapping on pipes at first, growing louder. More tapping joined in, off the main beat, using wood instead of the metal pipes. "Caitlin, I don't like this." Autumn turned in a slow circle. Her eyes darted left and right, up and down. "Caitlin?" Welcome back to the commentary. Caitlin gets the troops together, Autumn gets paranoid, and the Jennifers are still missing. Please read the chapter first to avoid spoilers. Two more seniors are introduced, Claire and Felicia. That means at least four rooms of seniors, including Caitlin and Vamsi's dorms. Both will re-appear in later chapters. For now, they're handy to have speak. Felicia is good at stating the obvious. Each girl, other than Caitlin, was voted by their dorm to go to the meeting. In Vamsi's case, it was three votes for her and one for Cassie. Caitlin voted for herself with no dissenting or, indeed, any other votes. I always had in mind that one of the Jennifers was going to be named Jennifer. Yes, it is confusing, but Jenn, to distinguish herself from the generic Jennifer, is annoyed by the misuse of her name because of that confusion. She does take a stand by insisting on her name. Jenn is a future dorm leader, just from her actions here. Caitlin does notice, as she does the response Jenn gives to her question. Sometimes, you have to phrase your question just right to get the answer you need. Autumn's paranoia was fun to write. She's overstating the response by a bit. The Ontario Regiment wouldn't be the first called out to the Academy. Containment is the key to preventing widespread destruction if the Unrulies did riot. The Diefenbunker is a real place, a decommissioned nuclear bunker created for use by the Prime Minister, his cabinet, and other Members of Parliament. It's now part museum, part meeting place. DiefCon, a gaming convention, was held there in 2014. The bombing is Autumn misreading a government document. Ontario does not arm its firefighting aircraft to assault girls' schools, even if they are housing a number of dangerous girls. Autumn's knowledge of government is lacking, though she doesn't trust what people tell her about the different levels. Laura does enjoy poking at her roomies' foibles. Caitlin has a better source about future bombings; her mother would call ahead. Caitlin's parents are military; her mother is Lieutenant Colonel Anna Kane-O'Shaughnessy of the Royal Canadian Air Force. She crewed on Auroras out of Greenwood, Nova Scotia. The CP-140 Aurora is used by the Air Force as a reconnaissance airplane, and would be used on the Academy to get a situation report without risking lower-flying craft like helicopters. Who knows what the Unrulies could have, right? With their experience as rioting Jennifers, the girls, save Laura, do have in idea of what to expect. A mob of half-feral young girls wreaking havoc should be breaking news, at least locally. Even if the news is in on the cover up, traffic cameras should still pick up disruption on the roads. If the Jennifers aren't out rioting, what happened? Laura's background comes into play. Not that she ever kidnapped girls or even drugged them, but her father knows people who know people in that field. Skye's explanation fits Occam's razor, "Entities should not be multiplied unnecessarily." The simpler theory is better, mainly because it's easier to prove or disprove. Caitlin has bribed Jennifers before, using chocolate. Tomorrow This evening, Chapter 3, "The Lair of the Jennifers". Also tomorrow today, over at Psycho Drive-In, how adaptations can surpass their originals. Saturday, over at MuseHack, Buffy the Vampire Slayer. Please be patient. The commentary will be up tomorrow. Time slipped by me this week. 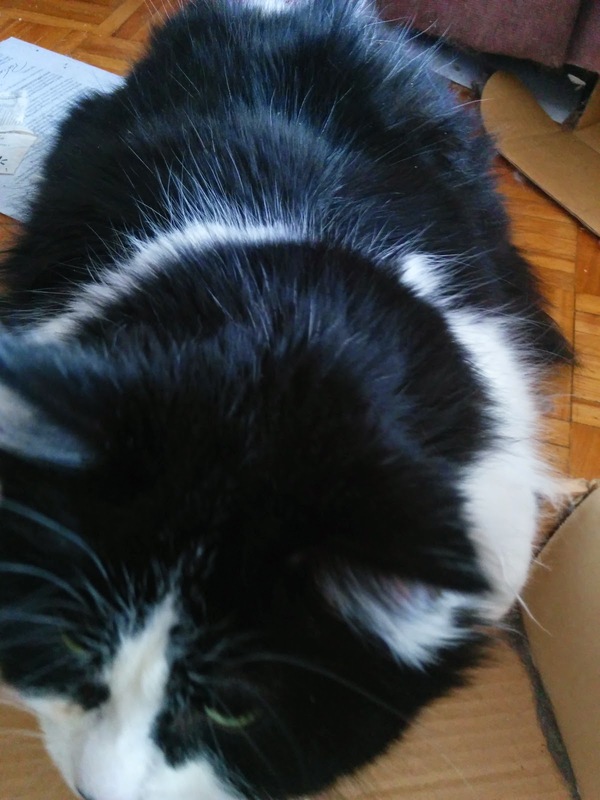 To bide the time, have a picture of a kitty. Out of the box kitty. 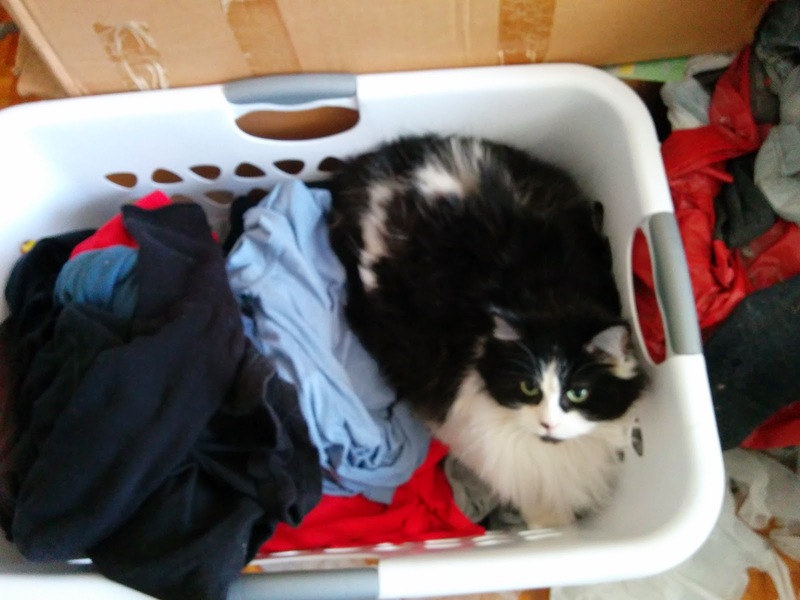 Yes, that is clean laundry she's in. "We were all Jennifers once." "Do you know how much damage the Jennifers can do running wild?" "Tanks. Lots of them. And that's just the beginning." Caitlin walked into the centre of the room. Each senior dorm room sent a representative to the classroom the redhead had commandeered. All eyes were upon the red-haired girl. "Thank you all for coming." Caitlin surveyed the room, making sure she had her peers' attention. "We have a situation. The Jennifers are missing." "Missing." Claire rolled her eyes as she scoffed. "Isn't that a little over-dramatic?" "Claire, so good you could come." Caitlin singled out her detractor. "Tell me, Claire, when did you last see a Jennifer?" "This isn't our problem, Caitlin." Vamsi stood up. "Hang on." She addressed Caitlin. "Caitlin, who pays attention to the Jennifers? They're no longer our responsibility. They belong to the juniors now." Murmurs of approval bubbled up. Caitlin nodded to Vamsi. "And what happens when the juniors drop the ball?" "They get what they deserve, really."